An armed and uniformed soldier stood atop a granite tower adorned with the Confederate seal. On the base of the monument are four stone cannon balls and two lighted lamps. In total the monument stood approximately fifteen feet high. On August 14, 2017, the Confederate Soldier statue was pulled from its base and badly damaged during a protest in response to violence and the death of a counter-protester, Heather Heyer, at a white supremacist rally in Charlottesville, Virginia several days earlier. One of those involved in the Durham protest said they would no longer “accept memorials to people who held slaves.” The damaged statue was taken by Durham police and placed in storage. A decision to attempt repairs or permanently remove the monument was to be made at a later date. World War I veteran, General Albert L. Cox of Raleigh, was the principal speaker at the unveiling ceremony. He told those gathered inside the packed courthouse decorated with Confederate flags they should “pause and reflect” upon what the Confederated soldiers had done for them whenever they passed the monument. Those in attendance also included more than 60 uniformed Confederate veterans from Hillsboro, Chapel Hill, Durham and even Virginia. Mrs. Jenn’e Webb Crabtree the aged sister of late Colonel R.H. Webb pulled the cord to unveil the statue. 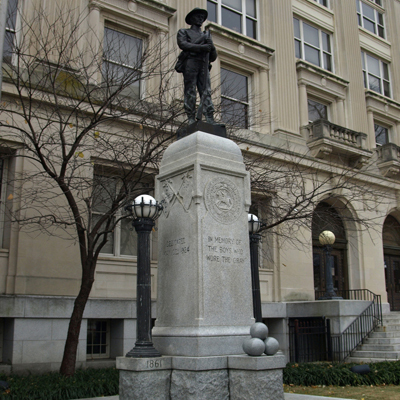 The statue was sold by the McNeel Marble Company from Marietta, Georgia, which produced many other Confederate statues and sold them all over the South, including Macon County Confederate Monument in Franklin, Pasquotank County Confederate Monument in Elizabeth City, Confederate Soldiers Monument in Hertford, Perquimans county, and Alamance County Confederate Monument in Graham. Efforts to erect a Confederate Memorial in Durham were led by the R.F. Webb Camp of United Confederate Veterans and Julian S. Carr Chapter United Daughters of the Confederacy (UDC). Typically, funding was by “local subscription,” holding fundraisers and support from local municipalities. In this case the sponsors appealed to the state legislature for $5,000 to be raised by a one half of one percent increase of all money “raised by taxation from all sources" for a one-year period. “General” Julian Carr for whom the sponsoring UDC chapter was named was asked to lead a commission to oversee the project which led to a controversy over the amount to be raised. Carr thought the amount should be $15,000 and he resigned in protest from the commission in April 1923 after not convincing Durham County Commissioners to ask the legislature to authorize the larger amount. In resigning he said it would be “a disgrace” for a county as wealthy as Durham to erect a cheap monument. News reports indicated local politicians “foresaw danger” in asking for the larger amount. After Carr resigned, the UDC chapter attempted without success to get the amount increased or find other funding. These efforts appear to have been unsuccessful as the monument placed was a relatively inexpensive mass produced model from the McNeel Marble Company. This monument was among several that was vandalized after the death of a counter-protester, Heather Heyer, at a white supremacist rally in Charlottesville, Virginia on August 14, 2017 and after President Donald Trump expressed his opposition to the removal of Confederate memorials. In early 2018, the Durham City Council and the Durham County Board of County Commissioners endorsed the creation of a committee on public monuments. The newly formed City-County Committee on Confederate Monuments and Memorials held a series of public meetings to gather feedback from the Durham community about the Confederate monuments and related remnants. The Committee has compiled its findings and recommendations in the Final Report presented to the City Council and County Commission on January 8, 2019. 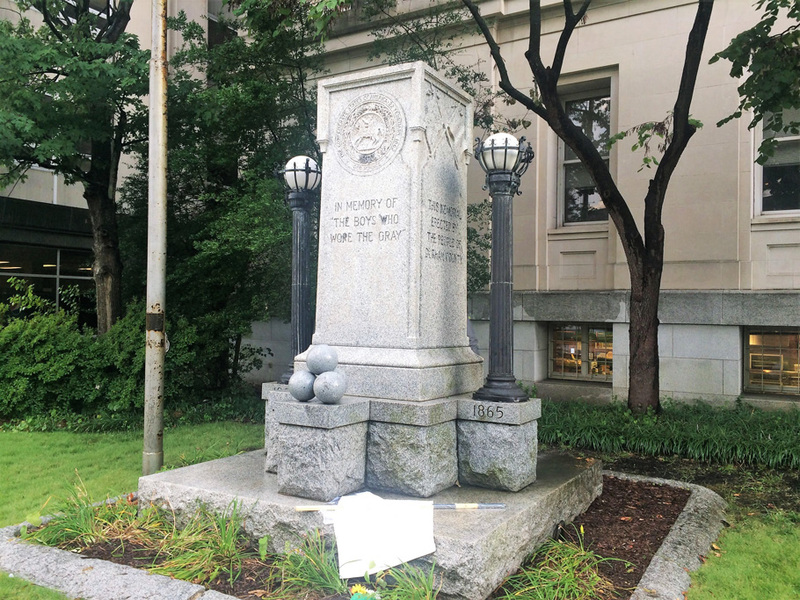 The Confederate Soldiers monument was located in front of the Durham County courthouse. 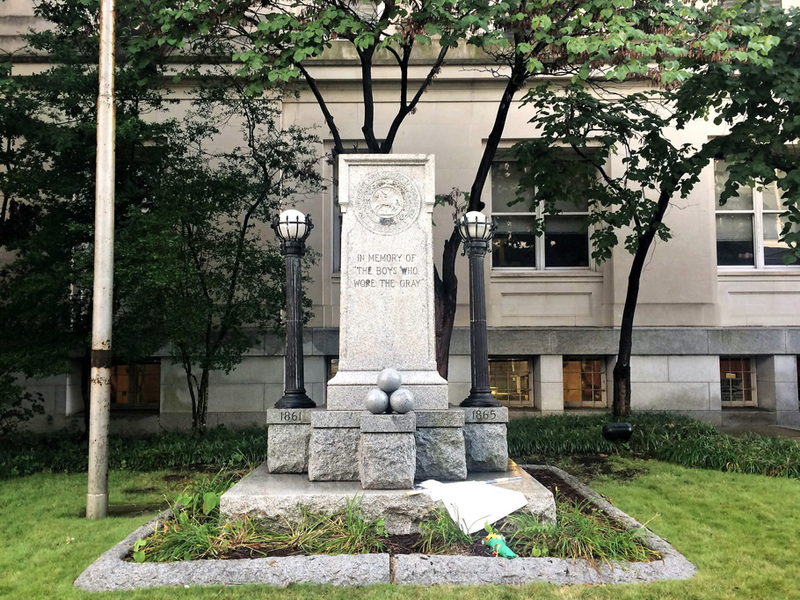 There are three memorials on the other side of the main entrance to the Courthouse: the Durham County World War I, World War II, and Korean and Vietnam Wars Monuments. The monument stood in a grass area surrounded by shady trees.